Welcome to the supplemental site for Exploring Greenland: Cold War Science and Technology on Ice. This site will contain supplemental materials from the book as well as maps, timelines, and exhibits. Check back in the future for further developments. 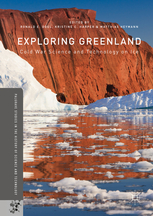 If you wish to purchase a a copy of Exploring Greenland, visit http://www.palgrave.com/in/book/9781137596871. Using newly declassified documents, this book explores why U.S. military leaders after World War Il sought to monitor the far north and understand the physical environment of Greenland, a crucial territory of Denmark. It reveals a fascinating yet little-known realm of Cold War intrigue and a delicate diplomatic duet between a smaller state and a superpower amid a time of intense global pressures. Written by scholars in Denmark and the United States, this book explores many compelling topics. What led to the creation of the U.S. Thule Air Base in Greenland, one of the world's largest, and why did the U.S. build a nuclear-powered city under Greenland's ice cap? How did Danish concern about sovereignty shape scientific research programs in Greenland? Also explored here: why did Denmark's most famous scientist, Inge Lehmann, became involved in research in Greenland, and what international reverberations resulted from the crash of a U.S. B-52 bomber carrying four nuclear weapons near Thule in January 1968? Kristine C. Harper is an Associate Professor of History at Florida State University. She rocuses on the history of recent science and technology. Matthias Heymann is an Associate Professor of history of science and technology at Aarhus University, Denmark, where he studies the history of the atmospheric sciences. He served as Project Leader of "Exploring Greenland: Science and Technology in Cold War Settings," funded by the Carlsberg Foundation. This book was published through Palgrave-Macmillan in the Palgrave Studies in the History of Science and Technology series.